The 25th of May my girlfriend Katrine and I set out on a journey where one of the objectives was to visit Istanbul. Fastest route south to The Balkans - follow The Adriatic Coast all the way to Greece - onwards to Turkey - visit/explore Istanbul - back home through Bulgaria, Romania, Moldova, Ukraine and Poland. Katrine and I have traveled together on two wheels many times, but on this trip a few things would be new to both of us. First of all we didn't bring camping gear. It meant a lot less luggage and this time of year finding vacant accommodation shouldn't be a problem. Besides that accommodation would be cheap in most of the countries on our route. We did bring sleeping bags though in case someone should offer us a couch to crash on. Secondly we had installed intercom in our helmets. After more than 20 years with total privacy in my helmet I was curious to try it out on a trip like this. 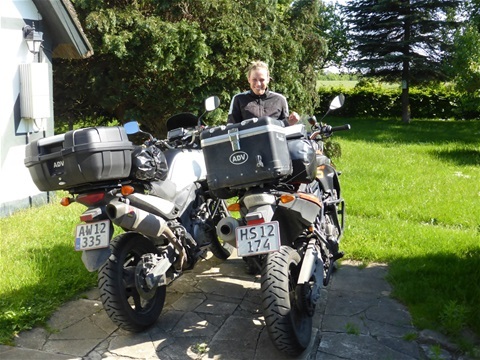 Last but not least it would be the maiden voyage abroad for the F800GS Katrine bought back in 2013 (her first non Japanese bike) - and as you all know taking a BMW on a longer journey can be... adventures. As the previous 3 years I would be riding my 650 V-Strom. We left home early in the morning and 2 hours later after a 45 minutes ferry crossing we hit the German autobahn. No speed limits and light traffic made it easy to cover distance in no time. After lunch we left the autobahn and continued on smaller roads. Late in the afternoon after a good days riding we arrived in Erfurt where we had taken Mathias up on his offer in The Tent Space Thread on Advrider. Mathias and his wife Isabella turned out to be excellent hosts and we had a great evening together. They showed us around down town Erfurt and offered us ice cream from the best vendor in town before making us a tasty BBQ dinner including the famous Thuringian sausage which was really good. After dinner we shared beers and stories with Mathias mostly as the narrator as he has done some really interesting trips - especially his 9 month/55.000km Pan-American adventure back in 2012/2013. The next morning Mathias send us off with a hearty breakfast. It had been a real pleasure to get to know him and Isabella. I hope that one day they'll give me the opportunity to repay their hospitality. It turned out to be an uneventful but nice day of riding. Early in the evening shortly after crossing the border to Austria we reached the town Wels where we stayed for the night at the charming old brewery "Gösser Brau" that was turned into a hotel. 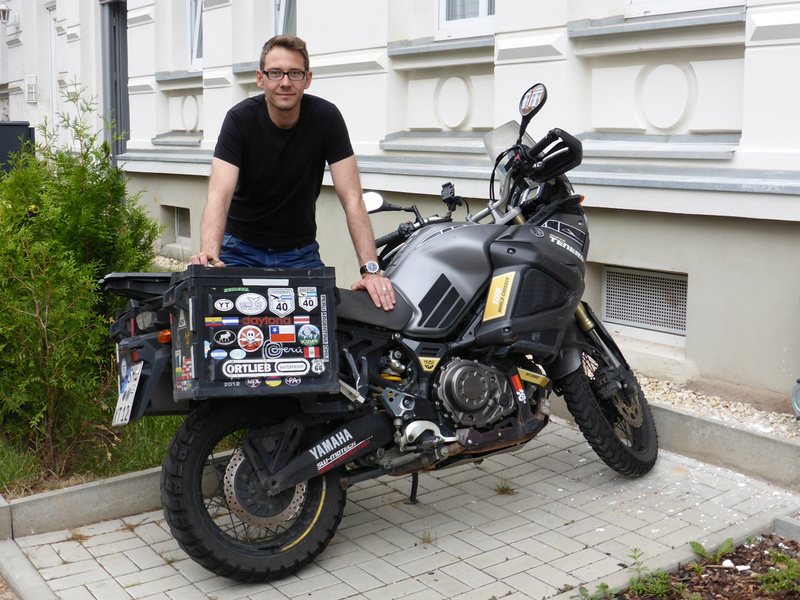 Mathias and his Super Ténéré in Erfurt. Part 2: Entering The Balkans. In the morning we were back on the bikes early. As the weather wasn't ideal with showers and low temperatures we avoided altitude as much as possible as we passed through Austria crossing the eastern outskirts of the Alps. On the south side of the mountains the weather got better and we had a pleasant ride as we entered first Slovenia then Croatia. 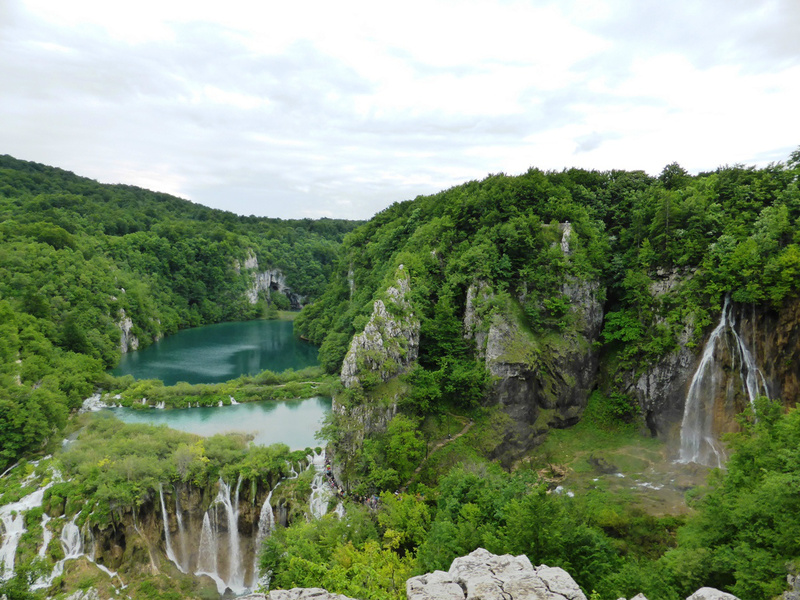 It was still early in the afternoon when we arrived at Plitvice Lakes National Park. We had originally not planned to visit the park, as it should be an extremely crowded place, but Mathias in Erfurt had told us it was worth a visit despite the many tourists. The night before in Wels I had booked a room at a highly rated guest house inside the park. The place "Villa Nena" turned out to be a real gem. It was perfectly located in a quiet and idyllic spot only 100 meters from the highest waterfall and 5 minutes walk from the lower lakes which is the most famous part of the park. After a quick change of clothes and a drink offered by the landlady we set out to explore the park. We were in for at treat! The lakes and waterfalls were amazing and there was not nearly as many visitors as we had feared. Often we had the walkways and trails all to our self. When we several hours later returned to the guest house we were greeted with a lovely dinner and cold beers. Part 3: The Adriatic Coast. We left Plitvice the next morning and continued south until we hit the Adriatic Coast just south of Zadar. From there we follow the coast through Croatia - then Bosnia - then Croatia again. Late in the afternoon we arrived in Dubrovnik where we check in at a guest house with a view over the harbor. The place was really nice and the guy who ran the place turned out to be the perfect host. First of all he moved his car to make room for our bikes in his garage. Then he offered us a drink gave us a map of the city and spend 20 minutes explaining the what, where and how's of Dubrovnik. Finally he gave us a lift to the old center of town and told us to call him if we needed help of any kind. We spend the rest of the day exploring the old town on foot. We had a good time and enjoyed a nice dinner before taking an late evening stroll back to the guest house as dusk settled. The next day we continued along the coast. First through Montenegro and then into Albania. This was our first visit to Albania and our initial impression wasn't exactly positive. The people we talked to was nice and friendly, but the country oozed of decay. Especially the emaciated dogs and cats rummaging through piles of garbage along the roads, brought Katrine in a bad mood. Traffic in Albania was a story in its own. A good example was when we on a freeway outside of Tirana encountered a horse drawn carriage going in the opposite direction in the fast lane. In the afternoon as we left the coast and headed inland towards the mountains things started to brighten up a bit. Less people meant less garbage and we had the first glimpses of the beautiful countryside that Albania also has to offer. We called it a day when we reached the town of Gjirokaster which is a UNESCO World heritage site. The old part of the town was really charming and we found a nice (and very cheap) hotel next to the town's only mosque. After a good dinner and a nice evening walk through the winding and steep streets of the old town we hit the sack. Part 4: The Greek connection. 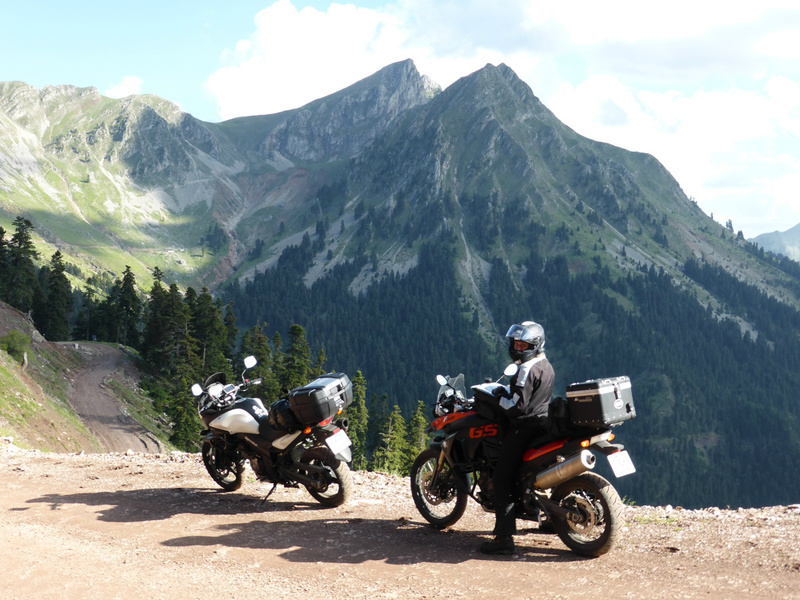 Last year I was contacted by a Greek guy here on Advrider who was planning a trip to Romania with some friends. I had done a lot of off road/enduro riding in Romania every year from 2009 to 2013 and shared some tracks, waypoints and good advice with him. After he returned from the trip he send me a thanking note saying that the info I had shared with him had been valuable and that if I ever visited Greece he would love to buy me a beer and show me around. Prior to this trip I contacted him and we agreed to hook up when Katrine and I got to Greece. We left Gjirokaster early in the morning and before long we crossed the border to Greece. From the border we follow a route suggested by my Greek connection Alex. 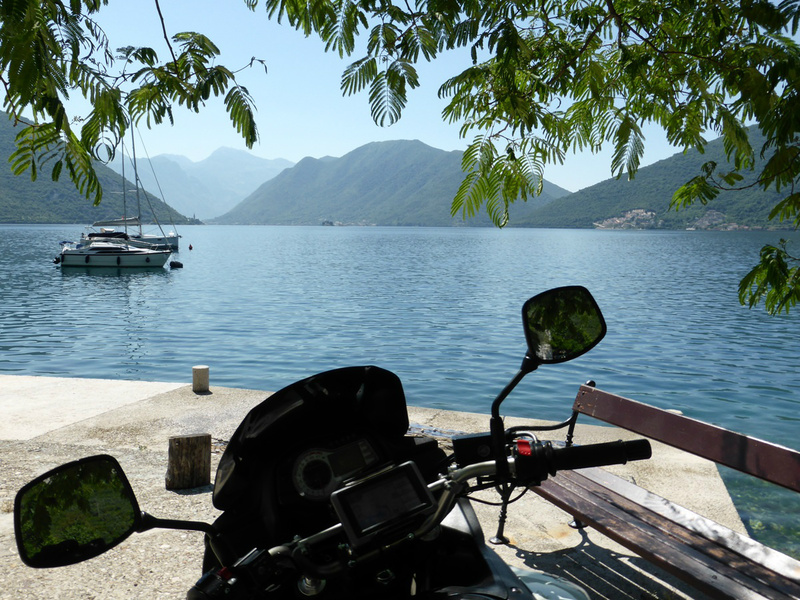 The route would show of some of the fantastic scenery and good riding Greece has to offer. The destination for the day was the small secluded village "Agrafa" situated in the mountains of northern Greece. It's only possible to reach the village by gravel and dirt roads - and quite a bit of those when coming from the north as we were. As we were having lunch in the small mountain town "Metsovo" (another recommendation by Alex) I received a text message from Alex saying that him and his wife were on their way north from Athens to meet up with us in Agrafa. The afternoon was spend on really interesting roads that just kept getting smaller and less paved. The last 2 hours of riding that day was spend entirely with gravel and dirt under the tires. The scenery was fantastic. As this was Katrines first time riding serious gravel/dirt roads on a big bike the going was slow, but she loved it and even the numerous hairpins didn't put her of - you can see some of the riding we did here. When we finally arrived in Agrafa we were warmly welcomed by Alex and his wife Despoina who waited for us at the terrace of the guest house where he had booked rooms for all of us. After a well deserved dinner and cold beers Alex showed us around Agrafa which is one of his favorite spots in Greece. I understand why. Conversation flowed easily and it was late before we finally called it a day and retired to our rooms after a fantastic day. Great riding in northern Greece. We woke to a crisp clear morning in the mountains. After a late breakfast and another walk around Agrafa we hit the road together. Alex and Despoina had invited us to come and stay with them in Athens before we continued to Turkey. The first half of the days riding was on small roads - first gravel later tarmac - through the mountains (see the video links in the text). The last half was mostly on the freeway. During the ride we had a nice coffee break in the mountains and a lunch stop by the sea. It was late in the afternoon when we finally arrived in Athens. Alex and Despoina's flat was located right next to the Olympic stadium in the center of town. When the bikes was securely stored away in a garage next door and Katrine and I was installed in the living room we set out with Alex as a guide to explore the ancient city. It was a wonderful evening and it was late before we got back to the flat. The next morning after breakfast and an exceptional good cup of coffee I follow Alex to a travelling agency to buy tickets for the evening ferry to Chios. Meanwhile Desponia and Katrine went for a walk around the neighborhood. When everybody was back at the flat we made ready for a day on the beach. 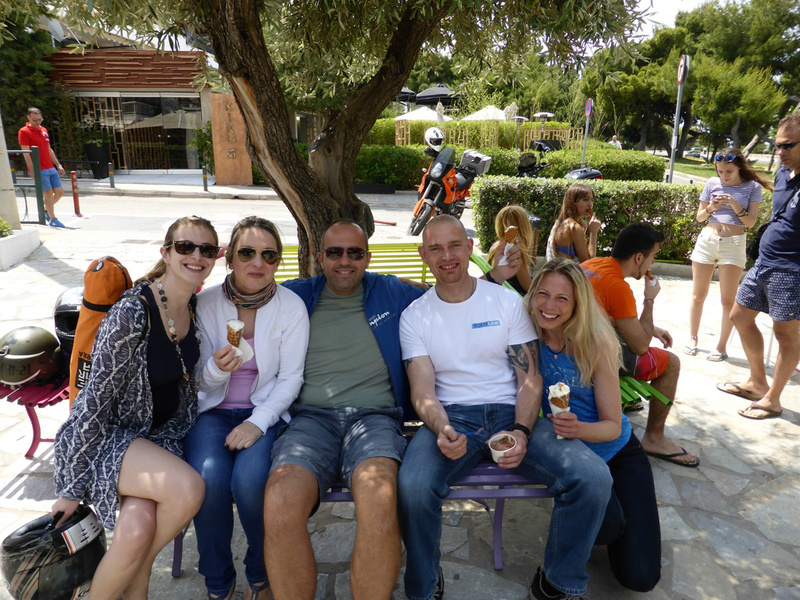 Alex and Despoina had asked some of their friends to join us and soon we were riding through the traffic of Athens. Katrine had decided to be pillion passenger for the day. On our way to the beach we stopped for an ice cream. The beach Alex had picked for the day was a small secluded one down the coast from Athens. After a couple of hours on the beach and in the water it was time for lunch. We got back on the bikes and went to a seafood restaurant on the coast. The food was very good and the company even better. Katrine and I really enjoyed hanging out with our new found friends. After lunch we headed back to Athens to get packed and ready to leave for the ferry. Alex and Despoina guided us the harbor and we said our farewells on the dock. It was emotional to say goodbye to the people who had so welcome us into their life's and I'm sure that we will meet again. The boarding procedure was chaotic but before long the bikes were securely parked on the car deck and we had a late night dinner in our allocated seats. After dinner we settled in for the night crossing. hanging out with new friends in Greece. 5 am we arrived in Chios just as dawn was breaking. The first thing we did was pick up tickets for the 8 am ferry to Cesme on the Turkish main land. The ticket office was located a short ride from the dock and easy to find. With the tickets well in hand we had time for a relaxing breakfast at a morning restaurant across from the harbor. The crossing from Chios to Cesme only took about an hour so around 9 am we sat foot (or rather tires) on Turkish soil which was a first for both of us. The weather was nice and the riding easy but soon it got apparent that Katrine hadn't slept enough during the night to be fit for riding. Around noon we did a pit stop at a Burger King that besides whoppers and milkshake could provide us with free wifi. We took out the map and the Ipad and soon we had booked a hotel room in the nearby town of Salihli. Salihli turned out to be a nondescript town and when we arrived we had some difficulties locating the hotel but the locals was extremely helpful and soon we found what we were looking for. It turned out to be a very nice hotel and especially the guy at the desk did everything in his power to make us comfortable. For one thing he made room for the bikes in the hotels laundry room without us asking. As far as we could see we were the only foreigners - not only in the hotel but the entire town so we drew a lot of (friendly) attention wherever we went. We spend a few hours walking around town and had a nice dinner before we returned to the hotel. It was still early in the evening when Katrine had to give in and call it a day. I stayed up looking at maps and planning the route for the next day. When I had finished creating an interesting route on small roads through the mountains I went out to the balcony to have a smoke. To my surprise it had started to rain and there was thunder and lightning on the horizon. The weather had been pleasant since we crossed the Alps and I hadn't been checking the forecast for several days. When I got back inside I did just that. The weather forecast for the mountains the following day promised heavy rain and a serious drop in temperature - time for a new plan. Katrine was well rested the next morning and after a huge breakfast buffet we were back in the saddles. Instead of going north through the mountains as I had first planned we tried to circumvent them on a more western route. The weather was nice in the morning but before long the rain started and the next 6 hours was spend in a downpour. Late in the afternoon just as we approached Istanbul the weather cleared up. The night before I had book room at a hotel in "Beyoglu" on the western side of Bosporus near the oldest part of the city. Beforehand people had given us numerous warnings about the traffic in Istanbul - now we had to pass through the entire city from the Asian side. As it turned out the traffic wasn't that bad. There was a lot of traffic and endless lines of slow/non moving cars but we found it quit easy to navigate between the cars and keep the bikes moving. Before long and without any incidents we arrived at the hotel. We spend the evening hanging out in the neighborhood, eating dinner at a really good restaurant just around the corner and making plans for the following day's exploration of Istanbul. 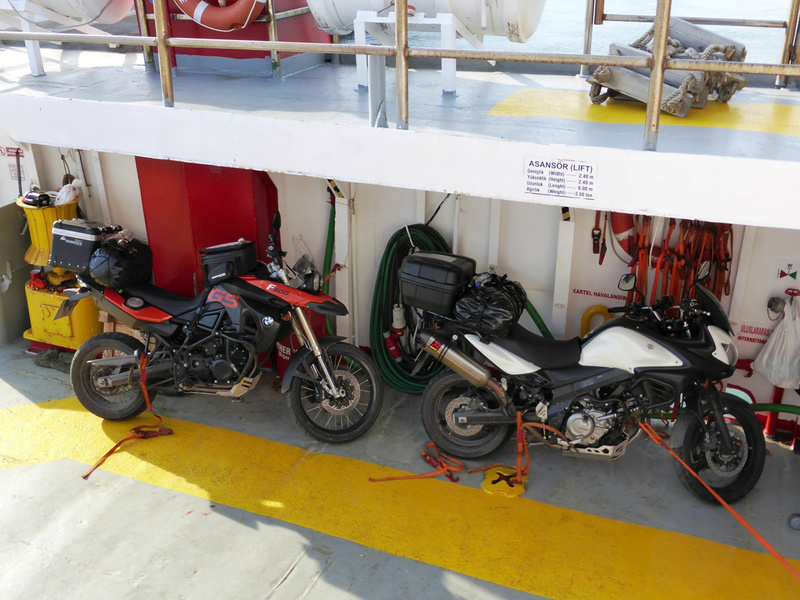 The bikes on the small ferry from Greece to Turkey. 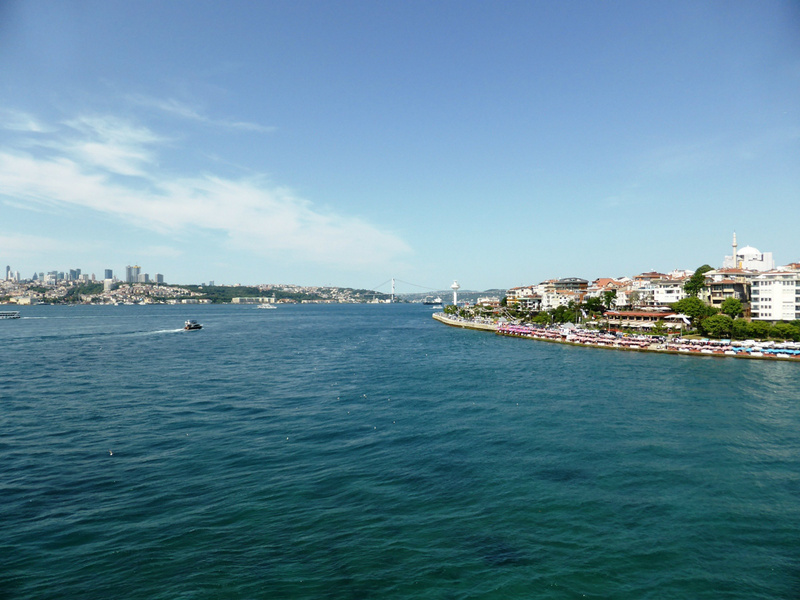 Part 7: Istanbul - The gateway between Europe and Asia. Breakfast was served in our room. Next thing on the day's schedule was getting our laundry done. As we arrived the day before we had noticed a small laundry shop next to the secure parking where we had left the bikes just down the street from the hotel. It turned out that they could have our laundry ready the same evening. Perfect. With that out of the way it was time to explore Istanbul. The city was relatively quiet in the morning and we had a nice walk down to the historic center of Istanbul on the other side of The Golden Horn from where we were staying. First stop was a visit to The Blue Mosque. Bare feet and proper attire required - legs and shoulders covered and besides that Katrine had to cover her hair with a scarf. Nice place but not really impressed. Next up was a visit to The Grand Bazar. That was interesting. The place had just the right bazar "vibe" and the more than 500 years old building added to the atmosphere. Noon was approaching and we needed a break from the hectic street life - time for a traditional Turkish Bath. We chose Cemberlitas Hamami which is the second oldest Bath in Istanbul and the oldest the allows both men and women - strictly separated that is! We paid for the "Sultan Treatment". First I stripped and donned a loincloth. Then I was placed on a baking hot slap of marble. After awhile when I was really sweating and started to think "OK - are they going to cook and eat me..?" a bath attendant poured water over me and gave me a thorough scrubbing which involve some pain and a lot of suds. When my attendant decided that I was clean and more scrubbing would leave my skin in tatters he gave me another rinse. Feeling very clean I was then passed on to my next attendant who gave me a massage - this part involved a lot of pain but was just what my body needed after several long days in the saddle. Afterwards I met up with Katrine in the lobby. Her treatment had been similar to mine but had included less pain and more pampering. Very clean and relaxed we found a place to have lunch. It was difficult to stay awake while we waited for the food. With full bellies and still finding it hard to stay awake we then headed down to the harbor to grab a sea bus to the Asian side of Istanbul as we wanted to visit Maiden's Tower. The tower is located on a small island in the Bosporus offering great views of Istanbul's waterfront. We then returned to the European side with another sea bus and walked back to our hotel. Before we returned to the hotel we remembered to pick up our now clean and dry laundry. The rest of the evening was spend packing and having another really good dinner at the same restaurant as the previous night - the food had been so good that we just had to come back. It was easy to fall asleep when we finally hit the sack. The view north from Maiden's Tower. As we had had enough of city life we left Istanbul the next morning. Navigating the morning traffic went like a charm - sometimes the cars wasn't moving but there was always space to keep the bikes in motion. We soon hit the highway and aimed for Bulgaria. Before noon we had crossed the border and left the highway behind. This was our first visit to Bulgaria and we immediately liked the country. The smaller roads was often in bad repair but interesting to ride. One of the reasons for that was that the traffic was very light and for a large part it consisted of horse drawn carriages. The countryside was idyllic and the vegetation very lush. After a nice afternoon ride in these conditions we arrived at Doug's Motocamp in the village of Idilevo. Earlier on our trip I had send an email to warn them that we might stop by and to ask if reservation was necessary as we needed a room (no tent on this trip remember). Polly (who runs the place together with Ivo) had been quick to respond "Just come. We'll find room for you". The place turned out to be everything I had imagined it would be. The atmosphere was relaxed and we received a warm welcome from Polly, Ivo and the other guests. As promised they had a room for us. Unpacking the bikes took a long time as we constantly got caught up in conversation. When we finally got settled in Polly made us pizza to accompany the beers. Initially we had only planned to spend only one night at the camp before continuing our journey. Polly was surprised to hear that and told us it would be a shame not to stay at least one more night and spend a day exploring the area. As we had really like what we had seen of Bulgaria so far, we decided to follow her advice. Maps were taken out and with input from especially Polly a roundtrip for the next day took form. It was a very pleasant evening in good company. Breakfast was served at 9 am and soon after Katrine and I hit the road. First destination of the day was Shipka Pass and the Shipka Memorial at Stoletov Peak. The weather was perfect and the views from the memorial was stunning. From Stoletov Peak we could see our next destination - The Buzludzha Monument - more popularly known as "The Spaceship". When we arrived at Buzludzha we parked the bikes at The Torch Monument and walked up the trail to the top. There is a paved road going all the way up to The Spaceship, but where's the fun (and exercise) in that. The Buzludzha Monument is barred for the public but someone has pounded a small hole in the concrete on the side of the building to create access. After a bit of urban exploring we returned to the bikes a continued our ride. In the afternoon we rode the Beklemeto Pass on our way to the town of Lovec where we stopped for dinner early in the evening. Lovec was lovely town and the day we visited some kind of dance festival was going on. It was getting late when we finally arrived back at the Motocamp. New interesting guests had arrived and it got really late before I said goodnight well satiated with stories and beers. Meeting interesting people at Doug's Motocamp. Katrine and I had a peaceful start to the day. All the other guests were still asleep as we packed the bikes before breakfast. As mentioned earlier Katrine and I have traveled together many times. One of the things we have learned is that staying more than 2 nights at the same place ruin the momentum of the journey and makes us restless. After breakfast and when we had said goodbye to people it was time to move on. From Doug’s Motocamp we continued north. After a couple of hours on nice small roads in Bulgaria we crossed the border to Romania and thence followed the main road to Bucharest. As we approached the city the traffic got dense and there was a lot of road construction going on. As filtering is second nature to Katrine and especially me none of it slowed us down much. It’s a blessing to ride a bike instead of a car in such conditions. We soon left Bucharest behind and entered The Carpathian Mountains. Late in the afternoon we arrived in the town of Sinaia. Polly had recommended the place to us. The mountain town is famous for its castles (Peles and Pelisor) and the Sinaia monastery that has given the town its name. The previous night we had booked a room at a hotel within the castle grounds. It turned out to be a really nice place. A small river with several waterfalls passed by on one side and on the other the driveway to Peles Castle. Before dinner we took a stroll around Sinaia. The castles and the surrounding old part of the town were charming. After dinner we looked at maps and talked about where we wanted to go from here. The original plan was to more or less follow the Black Sea coast of Romania and visit Moldova. During the journey we had talked to several people who had been to Moldova. None of them had much positive to say about the country. Monotonous agricultural country with tedious roads was the general verdict. When we told them it was part of our itinerary they all asked "why???" Our only answer to that was "we haven't been there before". 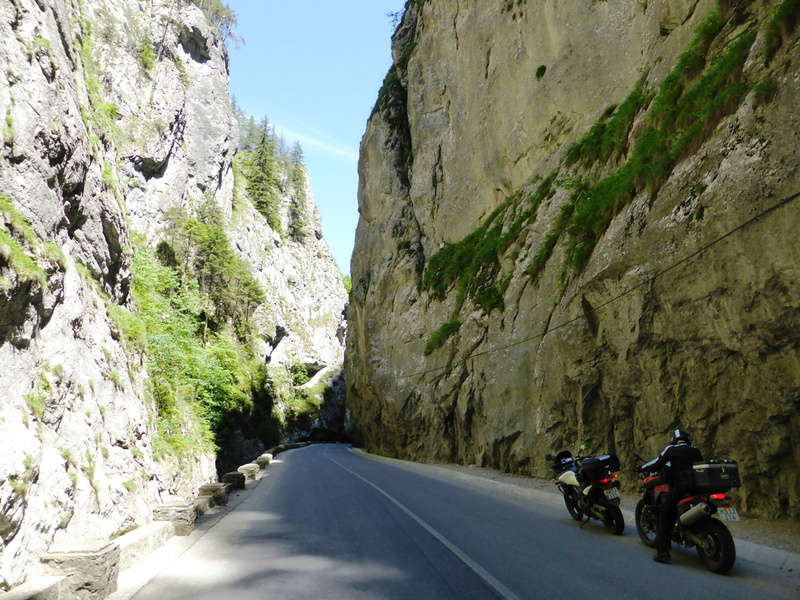 As we sat there looking at the maps we made a decision – as this was Katrine’s first visit to The Carpathians and we both love to ride in the mountains we would skip The Black Sea coast and Moldova and instead continue north through The Carpathians. As we set out the next morning there was a “LAMP” warning on the display of Katrine’s bike. The headlight’s low beam was dead so the first task of the day was to get a new H7 bulb. The first gas station we stopped at didn’t have them in stock but the attendant told us that the one just down the street probably did. He was right and soon the BMW was fit for fight again. The day was spend on interesting roads surrounded by stunning scenery. Around noon we stopped at a gas station to fill up the bikes and take a short break. While we were there 2 bikes with Czech plates pulled in. We soon started talking and before Katrine and I left we had received an invitation to stop by if we ever came to Prague. For a couple of hours in the afternoon we follow the same route as a small convoy of military trucks. One of them had young soldiers riding in the bed. We passed them several times as they were driving slowly while we on the other hand often stopped to enjoy the views and snap pictures. The soldiers in the bed smiled and waved at us when we passed them the second time. We waved back. Their smiles got bigger and their waving increasingly enthusiastic each time we passed each other. Here's a video showing some of the riding. Early in the evening we arrived at Sucevita on the outskirts of the mountains just south of the border to Ukraine. Originally Sucevita was just a monastery but over the centuries a small town has sprung up around it. We checked in at a hotel 2 kilometers down the road from the monastery. After a quick change of clothes we went to take a closer look at the monastery. It turned out to be open to the public. There was a sign at the gate asking visitors not to take pictures of the nuns and monks living on the premises. It was a tranquil experience to snoop around. We donated the remainder of our Lei (which wasn’t much) to the monastery when we left. The ancient nun who received the money was very touched by the donation. She insisted on writing down our names and then blessed us and our entire family. We returned to the hotel as the sun set – just in time to order dinner before the kitchen closed. The food was traditional Romanian and excellent. It had been a long day of great riding and several memorable moments when we finally got to bed that night. Part 10: Good people, bad roads and a happy reunion. The next morning when Sucevita vanished in the mirrors we also left the mountains behind. Before long we reached the border to Ukraine. The crossing went smoothly. This was our first visit to Ukraine. The first thing we noticed about the country was the road conditions. This was without comparison the worst roads we had ever ridden. Especially the main roads were really bad - a combination of potholes from hell and deep groves made by heavy trucks. We decided to try our luck on the smaller roads. They were in slightly better condition and much less crowded which made it easier to detect and avoid the potholes and other hazards. We soon got in to a rhythm (often standing on the pegs) and started to enjoy the riding and the scenery. We passed through a hilly and very lush countryside. Every time we stopped for a break in populated areas people would gather around to have a look at the bikes and a chat. The last part often proved difficult as we didn't share a language - but you can get a long way by using signs. People were very friendly. Late in the afternoon we arrived at the border to Poland. Although there wasn't much traffic the crossing took over an hour. The border officers and customs officials were polite but very thorough. From the border we set a brisk pace and it was still early in the evening when we arrived at the gate to a residence on the outskirts of Czudec. The residence is the home of Michal and his family. I got to know Michal last year. I was on a 2 weeks solo trip and took him up on his offer in The Tent Space Thread. When I visited back then his wife and kids were away for the weekend. Michal and I had a great time. Since then we have kept in touch. When he learned that Katrine and I would pass through Poland on this year's trip he urged us to stop by and stay for as long as we wanted. An invitation we gladly accepted. When we stopped at Michal's house Katrine was totally busted after a long and demanding day on the bike. Apparently nobody was home. I contacted Michal. It turned out that he had ridden out to meet us but we had taken a different route than he had expected. We agreed to meet up at a nearby restaurant. It was hard for Katrine to get back on the bike. A few minutes later Michal and his family greeted us at the restaurant. It was a pleasure to meet his wife Helen and their wonderful kids Zachary and Sophia. We had a good dinner before returning to the house. The rest of the evening was spend sharing stories and drinking beer. In the morning Michal and his family had left for work and school before Katrine and I got out of bed. We spend the morning hanging out at the house relaxing and catching up on stuff we had neglected while on the road. It was a real pleasure to spend time in and around the house. It's the nicest one I've ever visited. At the same time it's both stylish and cozy. The location on a hill side with forest on two sides and a view over the valley is phenomenal! Around noon Michal returned from work. He made us delicious burritos for lunch. We thought about going for a ride in the afternoon, but time slipped away as we were talking. Late in the afternoon we left the house in Michal's car to meet up with Helen and the kids. They were at the stable where they take horse riding lessons several times a week. When we got there Sophia showed Katrine and me around introducing us to all the horses. Afterwards we all had dinner together at a restaurant by the stable. After dinner we split up. Helen and the kids went back to the house. Michal, Katrine and I drove to Rzeszom for a night out. We ended up at bar/microbrewery at the city square. It was a really fun evening. Katrine wasn't exactly sober when we left the bar. A late bus took us back to Czudec. 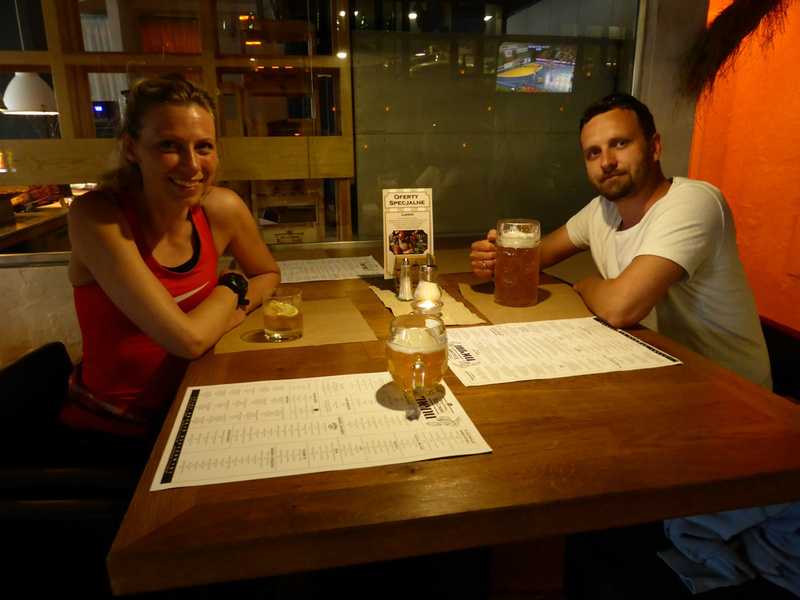 Enjoying a good beer with Michal in Poland. Part 11: The last leg. Katrine and I got up in time to say goodbye to Michal and his family. When they had left for work and school we packed the bikes, locked up the house and hit the road. We spend the day travelling west through Poland. It was a nice day. At one point we almost got into trouble. We were low on fuel. Gas stations indicated on the GPS was closed or not there at all. When we finally found a place to fill up we were riding on fumes. 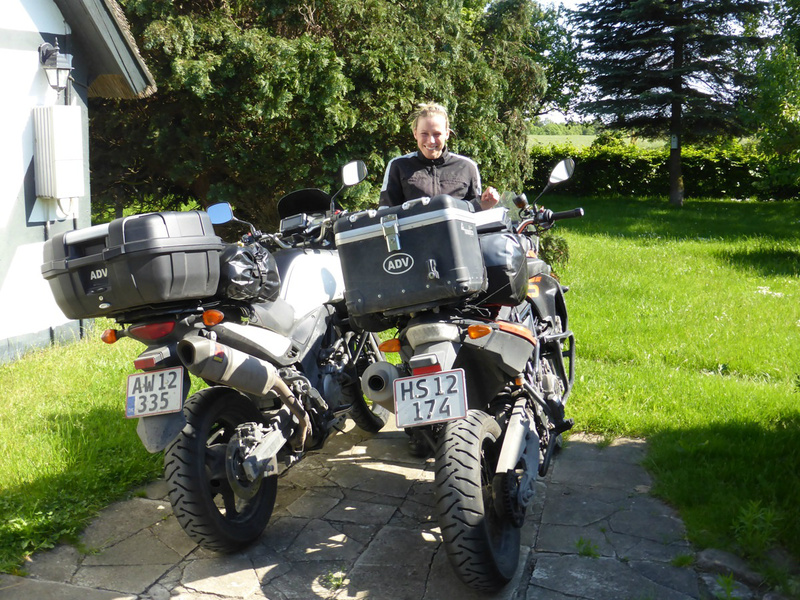 I was able to squeeze 20 liters in the V-Strom which has a 20 liters tank and Katrine 16.80 liters in the GS which according to the manual has a tank capacity of 16 liters. 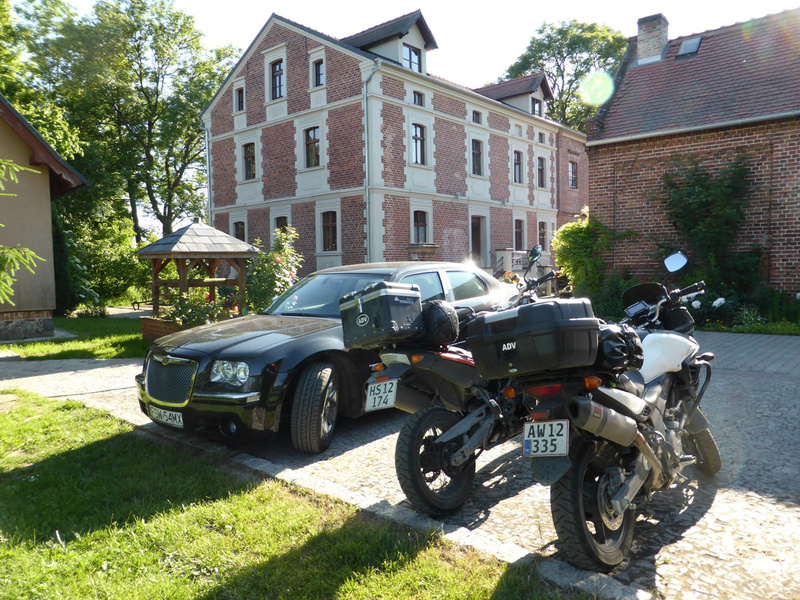 As the day drew to a close we arrived at Leniwka - an old mill turned into a hotel. The place was located near the town of Swiebodzin 50 kilometers from the border to Germany. Leniwka turned out to be a real gem. Situated in beautiful rural surroundings the gently restored the mill was charming and luxurious. The small staff was very accommodating. We got the last room. The rest was occupied by young surgeons attending a seminar on the premises. When dinner was served we discovered the real prize of Leniwka. The food was fantastic! I had one of - if not the best steak ever. The main course was followed be an equally delicious desert. Good beer, wine and coffee accompanied the meal. Food of this caliber is an experience. In the morning a breakfast buffet was served that matched the dinner the night before. We were stuffed like foi gras geese when we climbed aboard the bikes. This was the last day of our trip. It offered some nice riding but was otherwise uneventful. Late in the afternoon we arrived home and parked the bikes in our driveway. Back home after a fantastic journey. We covered 8.000 km/5.000 miles and visited 12 countries in 19 days. According to my GPS the bikes were moving for 105 hours resulting in an average speed of 76 km/h or 47 mph. It turned out to be a pretty cheap vacation. The main reason for that was the low cost of living in most of the countries we visited and traveled through. Overall both the V-Strom and the GS did well on the trip. The "all road" characteristics of the bikes served us well as we encountered a lot of roads in bad condition both with and without tarmac. When the roads got really bad the BMW was clearly superior to the Suzuki. The suspension is in another league and the ergonomics/slim waist makes it better for standing on the pegs and to control with the knees. The average fuel consumption for the V-Strom was 23.5 km/l or 55 US MPG. I didn't keep count for the BMW but it did better. We always refueled at the same time and Katrine typically used around 10% less fuel than me to fill up the tank. We only experienced 2 minor problems with the bikes - both occurring on the wet day in Turkey. On the GS the gear indicator started acting up not showing which gear the bike was in. On the V-Strom the ABS warning light came on and stayed on for a couple of days. The problem with the gear indicator on the BMW was easily solved - a connector needed to be cleaned and lubed. The ABS warning light issue on the V-Strom was another matter - scroll down in this thread on Stromtrooper to read more about it. As mentioned in the beginning of this thread we tried out a couple of new things on this journey. First of all we didn’t bring camping gear. For several reasons we never missed it. It was nice not to have to carry the extra load - especially in the evenings when we unloaded the bikes. Sleeping in a real bed every night resulted in us being more rested in the mornings. It made the long days of riding much more pleasant. We didn’t have to spend time making and breaking camp which gave us more time to ride and explore the places we stayed overnight. A few times during the journey we appreciated that we brought the sleeping bags. Not all guest houses supply sufficient bedding and on the night ferry from Athens it made sleeping more comfortable. I’m sure that we sometimes will bring full camping gear on future journeys depending on destination and purpose but this time around it was a good decision to leave it at home. Secondly we used intercom for the first time on a journey like this. It often proved useful. Katrine could let me know if she needed a break – and what kind. We could talk about the route while riding. Sometimes it’s nice to be able to share a thought that suddenly pops into your head. The kind of thoughts that is important but often forgotten before the next break. Most of the time my intercom was connected just to the GPS - listening to directions and music. Only when I had something specific to say/ask did I connect to Katrine. I found that small talk disturbed both to my thoughts and riding in a bad way. Thank you for tagging along I hope you enjoyed the ride.